Bill Hanna and Joseph Barbera’s first collaboration was in 1940 with Tom and Jerry’s “Puss Gets the Boot” and “The Night Before Christmas.” Both shorts were nominated for Oscars. The next three Tom and Jerry cartoons from the duo, “Yankee Doodle Mouse,” (1943), “Mouse Trouble,” (1944) and “Cat Concerto,” (1945), won the Hanna-Barbera team consecutive Oscars. When MGM closed their cartoon division in 1957, Hanna and Barbera began their own cartoon company (the name “Hanna-Barbera” was the result of a coin toss for whose name would go first). Since then, Bill Hanna and Joseph Barbera were responsible for the creation of more than 300 characters. As a team, they have won nearly every entertainment award possible, including eight Emmys. The duo has been inducted into the Television Academy Hall of Fame, and given a star on the Hollywood Walk of Fame. Both of these legendary animators have since passed away. 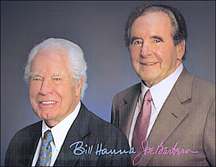 Bill Hanna passed away from throat cancer on March 22, 2001. Joe Barbera passed from natural causes on December 18, 2006.